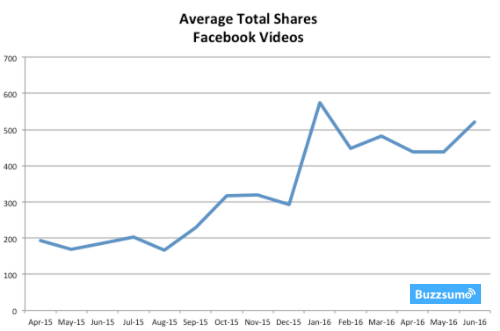 Our latest research shows that video is now the top performing format on Facebook. The team that is killing it with their Facebook video is BuzzFeed Tasty with an astounding average of over 470,000 interactions per video. In this post we will share 5 lessons we’ve learned by analyzing BuzzFeed Tasty. You can improve the performance of your Facebook videos by applying them now. Go straight to the lessons. Other types of content, particularly links, have not fared as well–they are creating less referral traffic than they did a year ago. To learn more about what types of videos resonate with the Facebook audience, we analyzed the top 500 recorded videos posted during April and May 2016, as well as the best performing videos from the pages whose videos got the highest average number of interactions. 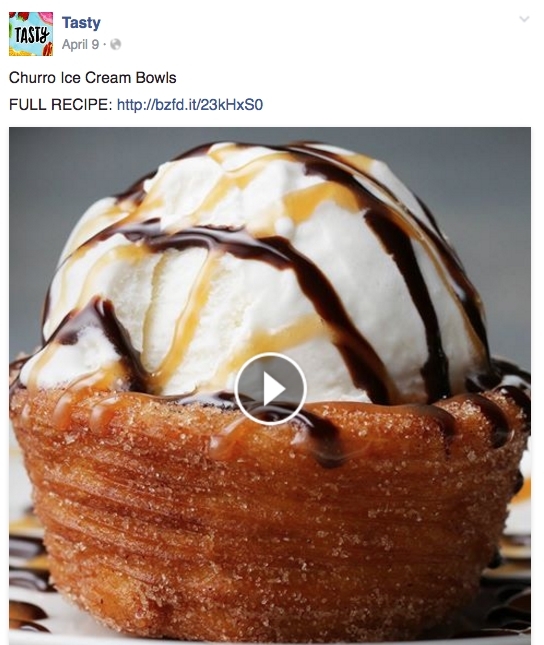 BuzzFeed Tasty is the unequivocal Facebook Video leader. The page’s beautifully filmed cooking demos dominate any metric of Facebook engagement. To understand the absolute mastery of BuzzFeedTasty videos, consider this: Of the top 500 Facebook videos published during April and May 2016, 253 were from BuzzFeedTasty. In second place is TipHero, with 63 total of the top 500 videos. 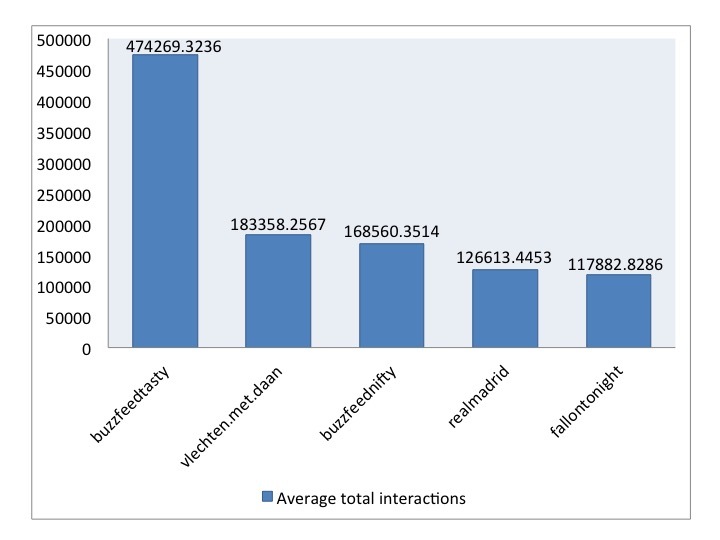 Another way to illustrate the significant number of interactions gathered by BuzzFeed Tasty videos is to compare average total interactions with average total interactions from the other top pages in our sample. If you are a Facebook user like me, you may not be surprised to find Tasty videos listed here. I wasn’t, because I’ve seen numerous shares of Tasty videos in my personal feed. What was new for me was the knowledge that Tasty videos aren’t just popular among my friends–many of whom like to cook. It’s Facebook wide! During a BuzzSumo virtual water cooler discussion of this Facebook food video phenomenon (Our water cooler is Slack), one of my colleagues stated flatly that people simply like to look at pretty pictures of food. End of story. But I wanted to go a little further in analyzing successful video posts. I wanted to know why food videos have become a part of the relaxation or distraction routine of so many people. More importantly, I wanted to know if there were actionable insights to be uncovered for marketers. I spent a lot of time watching Tasty and other videos, teasing out the common elements. My conclusions and marketing takeaways are described in more detail with each point below. Aspirational These videos take a common object and make it beautiful, or they take a common task and make it look fun. 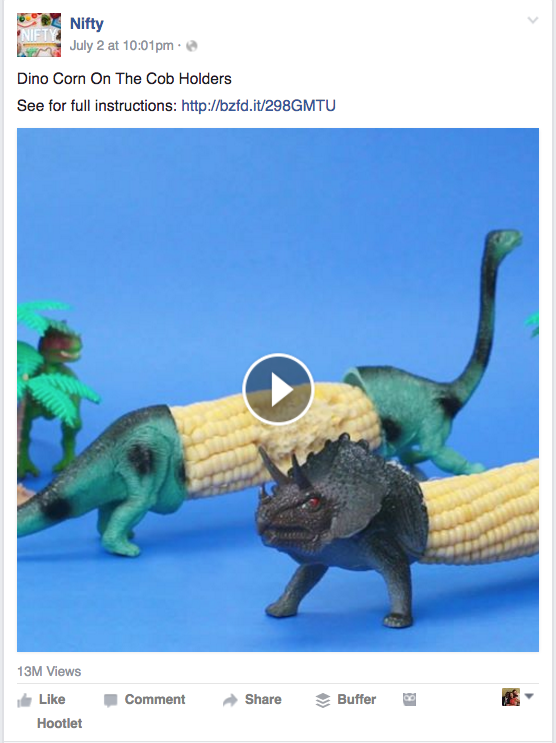 DIY The most popular Facebook videos show the viewer how to do something. Simple. The most shared videos provide simplified instructions. Short The most shared videos are all under 2 minutes long. Voice-less. The most shared videos don’t include voiceover content. They are equally understood in sound-off mode as with sound on. If these characteristics were present only in Tasty videos, they would still be worth a try. But, Tasty isn’t the only page that is succeeding with these principles. BuzzSumo developed a list of the top Facebook pages based on the average total interactions with videos. (We’ve also created a list of the top publisher pages producing videos). BuzzFeed Tasty, Vlecthen.met.daan, and BuzzFeed Nifty rank highest, but Football clubs Real Madrid and Barcelona, as well as the TV show Game of Thrones are also on the list. Next, I used the BuzzSumo Facebook Analyzer to find the most engaging videos from these top pages. My analysis showed that eight of the top pages, including all of the top three, are very similar to Tasty. More tellingly, those that weren’t similar to Tasty had something significant in common with each other. Their product is primarily distributed via video! Soccer clubs and Game of Thrones have worldwide broadcast audiences in place. Musicians and recording artists also have a considerable amount of video footage as part of what they offer fans. Unless a product is already primarily distributed via video, marketers should use Tasty video characteristics as a starting point in their video strategy. The top videos are all aspirational in nature. The majority of the food items prepared during a Tasty or TipHero video aren’t everyday staples. Fifteen of the top 25 videos demonstrate how to make appetizers, desserts, sangria, or special occasion breads–party foods. They certainly are not Wednesday-night-in-the-home-kitchen items (if they are a staple on Wednesdays in your home, invite me over!). I think these videos are attractive in part because they take us out of the everyday grind and remind us of special occasions. The length of the videos is also aspirational. In Tasty videos, pork ribs are ready in 42 seconds. We all know that the process will take much longer in real life, but we suspend reality in order to dream of preparing a delicious, beautiful main dish in less than a minute. That’s aspirational thinking at its best. These videos are also aspirational because they include only the best parts of cooking–chopping, adding, stirring–no pesky shopping trips, no digging in the spice cabinet or fridge; no washing dirty dishes. In Tasty videos, the ingredients magically appear. The used items simply vanish. This goes beyond aspirational; arriving solidly in the realm of wishful thinking! Strangely, viewers don’t seem to care. They are engaging with an idea, a fantasy, a dream of mess- and stress-free meal prep. It’s not just food videos that are aspirational in nature. BuzzFeed Nifty is just like BuzzFeedTasty, but it features crafts made with everyday objects. The aspirational element is clearly visible on this page, despite it’s different topical emphasis. Elevating common objects to new levels of beauty and ingenuity is the pinnacle of aspirational thinking. Case in point: Consider a common, inexpensive child’s toy, the plastic dinosaur. What if the plastic dinosaur could also become an entertaining centerpiece at a barbecue that will cause guests to admire its ingenious new use? The video showing how to do this craft has been viewed 14 million times and has more than 115,000 interactions. Vlechten.met.daan also exemplifies this aspirational quality. Their hairstyle videos cause viewers to think about new and different ways to wear their hair. What if this ponytail could also become a set of bangs (no scissors required!). Or what if this plain plastic headband could easily create a more elegant look? Help your audience suspend their reality. If you can make a mundane task look good, do it. Focus on the best parts of a process. For example, if you are demonstrating software, don’t show the data entry step. Focus on saving time. Don’t just say that your product will save time. “Prove” it with a short video. Consider developing a passion page around an inspirational idea that is related to your product. The passion page audience could be encouraged to learn more about your product or service. This may be especially useful for B2B company’s struggling to make their product appeal to Facebook in aspirational, entertaining way. Facebook videos are not the venue for illustrating case studies or white papers. The purpose of these videos is to associate you and your brand or product with simple solutions for your audience’s problems. For example, Tasty and TipHero give simplified answers to questions like: What’s for dinner, what’s for breakfast, what can I cook for a party? Vlechten.met.daan gives step-by-step instructions that make fancy hair do’s look easy to create at home. Nifty outlines craft projects. We’ve already noted some of the sleight of hand involved in Tasty style videos: leave out the unattractive parts and significantly shorten the process. The best videos reflect a great deal of creative license! The simplification is part of what makes these videos entertaining. They often contain an element of surprise. You watch and are amazed and delighted that the effort portrayed in the video could produce such a satisfying result. Remember, the most successful Facebook videos are simply visually appealing bullet-points for a project. While not as sparse as the BuzzFeed Tasty or Nifty videos, Aetna has a 1:19 minute video describing the different types of US health care providers and when to visit each. It simplifies the decision process by giving one or two examples of when each type of care center is appropriate. Illustrate only the most important points of a process. Delight people with how little effort is required for a great result. Keep entertainment foremost in your mind. Show the pretty parts of the process, and downplay the less enjoyable parts. Although none of the top Facebook videos identify themselves as DIY, the are all designed to help viewers do something for themselves. Arguably, food preparation, crafts, and hair styles lend themselves well to how-to posts, as do product demos. Outside of product demos, it’s smart to consider other tasks your audience might be interested in accomplishing for themselves, and how you could relate the accomplishment of those tasks to your product or service. Moz.com’s Whiteboard Fridays are a great example of DIY style teaching. These engaging videos feature explanations of how to do specific content marketing tasks. 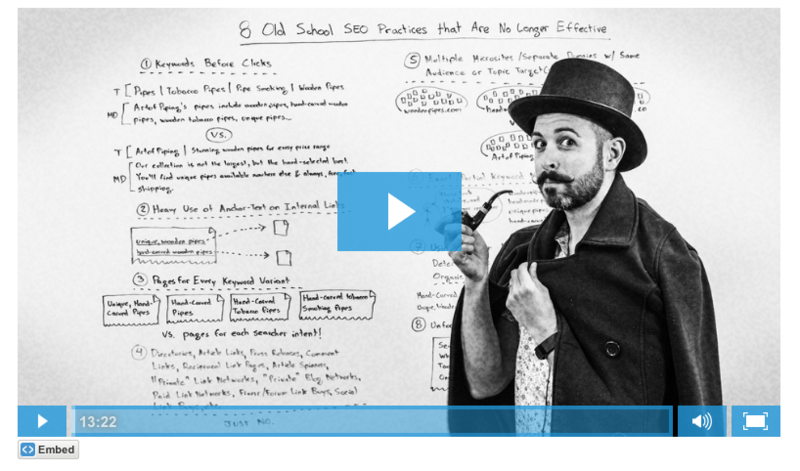 Whiteboard Friday videos aren’t Moz product demos. They are problem solving, how-to explanations. This type of content, edited Tasty-style would make a powerful impact on Facebook. Providing helpful how-to knowledge or information for your target audience, even if it’s not immediately related to your product or service, builds your brand and strengthens your audience’s opinion of your company. Create a list of tasks that you could demonstrate for your audience. Use Quora, customer service feedback, or Pinterest guided search to uncover audience interests and questions. Answer their questions. Appeal to viewers’ desire to accomplish or create. Not only were all of the most engaging videos under two minutes, 14 of the top 25 videos were less than one minute. The same could be said for a Facebook video. Video editing makes visual brevity possible. Tasty videos feature numerous “scene” changes, even in videos less than one minute long. And, lengthier tasks, like cooking ground beef, are displayed at higher speeds. In addition to a limiting the length of the videos themselves, the top Facebook video posts and also have very limited text in the accompanying post. For example, the most shared video posts from FC Barcelona were all accompanied by posts of 0-50 characters. If you (like me) tend toward wordiness, try using the free site Expresso. Simply enter your text, click analyze, and Expresso will highlight ways to improve and shorten your writing. If you aren’t sure how long your posts are in characters, try free online character counters like Lettercount.com. Another handy rule of thumb: if it’s longer than your first name, last name, and job title, it’s too long. Your videos for Facebook should be no longer than two minutes and many should be less than one minute. Opt for more, shorter videos rather than one long video. Remember: if it’s too long for a tweet, it’s too long for a Facebook post. The most engaging videos on Facebook don’t include voiceovers. They have sound, but its purpose is emotional, not informative. Remember that videos are initially displayed in viewers’ newsfeeds with sound off. Only those who click through to the video will hear the sound. Text overlay with fun music is the perfect combination for providing a lovely sound-on experience and an intelligible sound-off version as well. Create a transparent background .png image of your text with a tool like Pixlr. Our research makes it clear that now is the time to start or increase your Facebook video strategy. 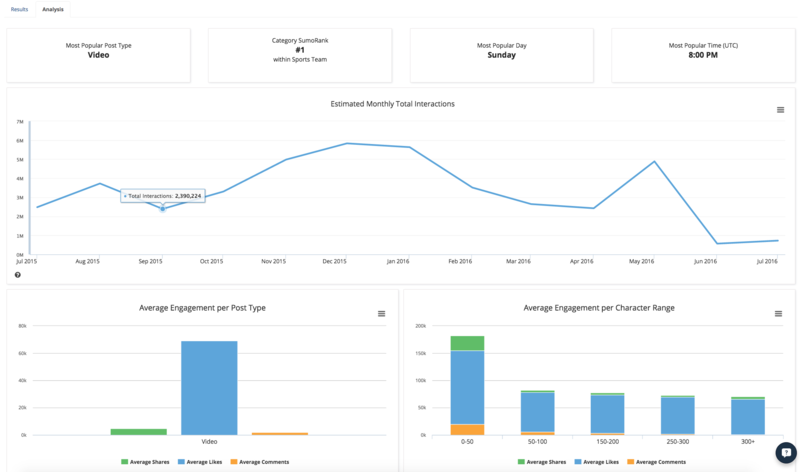 Tasty provides some great insights to get you started. Most of the pages in our list of top 500 video producers are publishers or B2C companies. The door is wide-open for B2B brands to grab their audience’s attention with informative and entertaining video. If you or your brand are already succeeding with video, we’d love to hear about it. Nice post, but would have good if the examples were embedded, instead of screenshots (so I could preview the videos). Working on that. 🙂 Thanks–it would improve the post. why don’t you u go to hell and burn there??!!!!….. Promo lets you create short video in production quality in less than 5min. What about Facebook Live? The advice for those appears to be totally different. Those videos you’re talking about sound like they’re heavily edited? Nice post but would have been good if the examples were embedded, instead of the screenshots! exmples what you put on your content.Thank you much for sharing this with us. Great article, we have a ton of users using our native video designs to make “Buzzfeed style” videos for their Facebook page, it really is blowing up on Facebook these days!Facebook has a large opportunity in communicating with consumers or attracting new flow of traffic.